The beginning, of something new. For next year, that is! “I hate change.” Hanne and I are wheeling back from the compost bin just before lunch. “I LOVE change!” Hanne exclaims. Sometimes I wish that I, too, had a slightly stronger predilection for change and transition. I remember this brief conversation that we had a few weeks back, with a smile and touch of nostalgia. Remember those rainbow carrots we’d been waiting on? The first harvest of those guys happened last week! Sadly, it was also the week that school started, so I missed that glorious harvest day. But the important thing is… RAINBOW CARROTS! 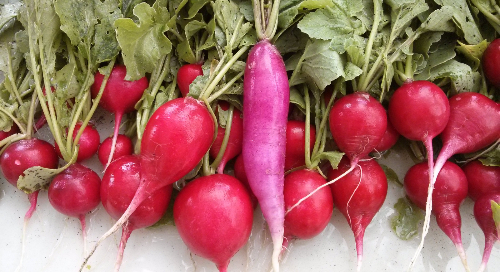 This week, we harvested some pretty handsome komatsuna, green onions, and a big batch of beautiful beets! Amongst other fresh goodness. Well, school has officially started, and that means that I’ll be at the farms less. Bake in the oven for 10 minutes at 350F. It’s on cold, wet days like these that I am thankful for the standing water in my tub that drains at the speed of a drunken tortoise. I am thankful for the extra moments of lapping warmth that my numb feet get to soak in. I stop, and I stand for a minute to enjoy it. Wiggle my toes in it. Ahh. We were suppose to be offering it as “baby spinach”, but… after the crazy storm this past weekend, it kinda wasn’t really baby anymore. More like humungous spinach. “The spinach got drunk on water,” Gerson said. Harvesting spinach this week had a touch of poignancy for me. Spinach was the very first crop we as interns learned to harvest–pick each leaf one by one near the base of the stem, check underside for ickiness, check for yellowing on the leaf edge, practice a two-handed motion, leave the tiny leaves for regrowth… I remember feeling so sore in my shoulders and back from bending over the beds so much to pluck spinach. Over the season, my body has gradually gotten used to it. Big beautiful beets are back, too! Hanne, Gerson, Cass and I reminisced about another wet day early in the season when we harvested spinach. We took turns going inside the school to run our hands under warm water, and ended up bringing a tote full of it outside. From March spinach, to September spinach. The leaves taste of the same heartiness, only rain kissed. Seasons do come full circle, they do.